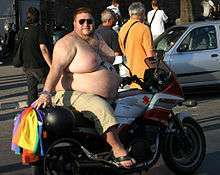 A chub is an overweight or obese gay man who identifies as being part of the related chubby culture. Although there is some overlap between chubs and bears, chubs have their own distinct subculture and community. There are bars, organizations and social events specifically catering to this subculture, which allows members of the community to socialize with each other and develop social networks. In the last several years, large regional social events have developed. They often feature pageants much like beauty pageants but more sexual in the attitude in which titles are given to winners, like "Mr. Chubby International" and "Mr. Chaser International". In the United States, there is an annual national event, Convergence, as well as several annual regional gatherings. There is also an annual event in Europe called European Big Men's Convergence. These events are held in different cities each year and are usually hosted by that city's local big men's organization. Grommr – a website geared toward gainers (gay men who not only love their large size as it is, but also want to get bigger as well) and their thinner counterpart feeders who enjoy seeing their men get bigger. BiggerCity A chub and chaser website active since 1998. Chasabl A partner site to Grommr that does NOT focus on gaining. Ron Suresha's anthology "Bears On Bears" indicates that, while casual social networks for chubby men and chasers had long existed, the first organized social group in the United States, Girth & Mirth, formed in 1976 in San Francisco. The following year, a chapter was organized in Boston, and in 1978 the New York chapter started. Conventions were held in cities such as San Francisco, Chicago, and New York City as early as 1977 or 1978 with large numbers of chubbies and chasers attending. The first meeting to use the name Convergence in the United States was held in Seattle in 1986. Several chapters are now active across the United States, mostly in large and diverse cities.